Fairbanks, Alaska (AK) - The 2018-2019 Fairbanks Winter Guide is now available for free. The Winter Guide, designed to help plan vacations in the winter season, is a 32-page full-color booklet. Filled with winter activity listings and an action-packed events calendar, the guide offers an informative, yet a lighthearted view of winter in Alaska’s Interior and Arctic. 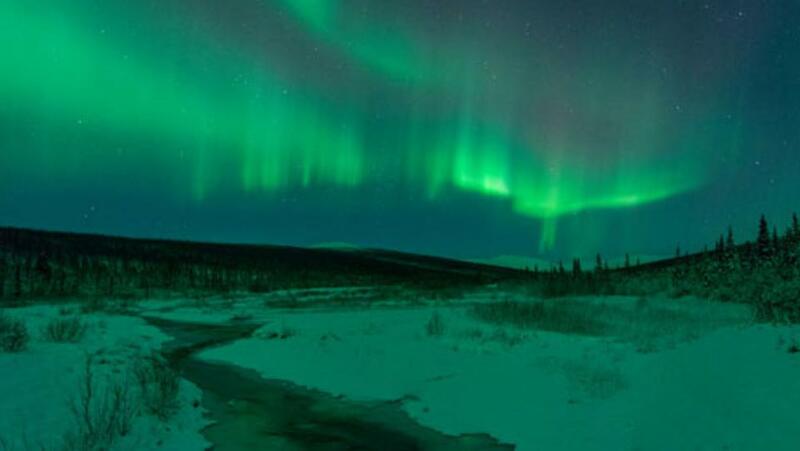 Fairbanks is an excellent place to experience the northern lights because it is under the “Auroral Oval,” a ring-shaped zone over the far north where aurora activity is concentrated. Additionally, Fairbanks’ low precipitation and distance from coastal areas contribute to consistently clear nights. In addition to northern lights viewing, Fairbanks also offers ice sculptures and the exhilarating sport of dog mushing. This trio of events makes the winter season a traveler’s snowy paradise. The guide presents Fairbanks attractions and activities and also highlights nearby winter destinations. Visitors are invited to mush a team of huskies across the wilderness, discover Denali National Park and Preserve during the winter months, journey above the Arctic Circle, visit Santa in North Pole, or delight in the warmth of an Alaskan hot spring at the end of an adventure-filled day. Winter activities in the guide include skiing, ice skating, snowmobiling, snowshoeing, ice fishing, curling, tubing and ice hockey. The calendar of events section provides current information about winter activities, celebrations and sporting events. Showcasing iconic events such as the Yukon Quest International Sled Dog Race, the Festival of Native Arts and the Iron Dog, the world’s longest, toughest snowmobile race. The diverse art scene in Fairbanks, including musical and dramatic performances, Alaska Native cultural events, art galleries and museum exhibits, is also featured. For a free copy of the 2018-2019 Fairbanks Winter Guide, contact Explore Fairbanks at 1-800-327-5774 or (907) 456-5774 or write to 101 Dunkel Street, Suite 111, Fairbanks, Alaska 99701-4806. You can also order the guide or view it interactively online at www.explorefairbanks.com. Explore Fairbanks is a non-profit destination marketing and management organization whose mission is to be an economic driver in the Fairbanks region by marketing to potential visitors and optimizing the visitor experience. Explore Fairbanks markets Fairbanks as a year-round destination by promoting local events, attractions and activities to independent travelers, group tour operators, travel agents, meeting planners and the media as well as by developing public policy and infrastructure to achieve marketing objectives. Find out more at explorefairbanks.com.